Please see PCC website for more information. *Note: All figures are in Canadian Dollars. Fees do not include equipment (knives, uniforms, shoes, rent/accommodations, etc.). Canadian students enrolled at the Stratford Chefs School are eligible to receive up to $4000 in grants. They also have access to Canada Apprentice Loans, all of which help to offset tuition and living costs. The Canada Apprentice Loan is available to Apprentices. The AIG is available to all apprentices who have successfully completed the first or second year of a two-year apprenticeship program. The taxable cash grant may be up to $1000 per year (to a maximum of $2000). The ACG is available to all apprentices who have successfully completed the Certificate of Qualification Exam (after January 2009). The ACG is a $2000 taxable cash grant. If you are an apprentice and have been directed by the Province of Ontario to attend full-time classroom training as part of your Apprenticeship Training Program, you may be eligible to receive EI benefits while attending school. The Province does not direct apprentices to attend the Stratford Chef School for their training. The Stratford Chef School has control of who is accepted as a student, and in turn registered as an apprentice to their Sponsor Group. The Province has no input as to which applicants are successfully accepted into the program. Your EI benefit application must be submitted online from the Service Canada website. You will receive further details regarding the EI application process, including information on how you will receive the required 16 digit reference code, during orientation week. You do not need your Record of Employment* to apply for EI benefits online, but it is needed to calculate your benefits. *Your employer must provide you with a Record of Employment within five days once you have finished working. As BMO is our financial partner, we have linked their Student LOC program above. However, most financial institutions offer a Student Line of Credit, so please check with yours to learn their eligibility criteria, interest rates and repayment terms. 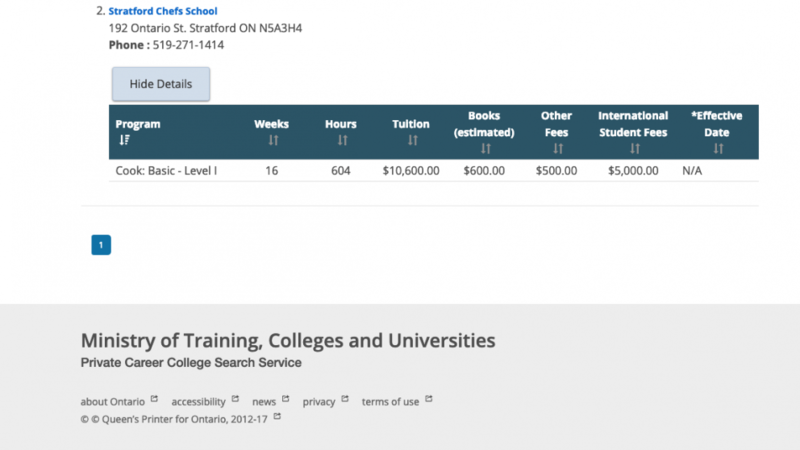 Please click here to learn about OSAP Loan Default Rates and Repayment Plan Assistance Usages Rates (2016). Scholarships and bursaries are also available to students, either by application or nomination. Applications for the Stratford Chefs School’s two-year Diploma program are accepted year-round.